We love monograms at Anita Goodesign and we wanted create an elegant monogram in both a stitched and appliqué version. 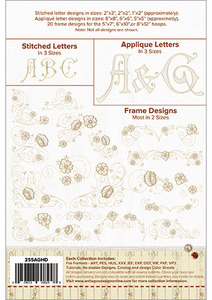 Each of the letters comes in 3 different sizes so no matter what you want to stitch them on you will find the perfect size in this collection. The appliqué letters would be perfect for large pillows or tote bags while the stitched letters will look perfect on smaller items. The monogram letters were all designed to work as a single letter placement or in a traditional 3-letter placement. 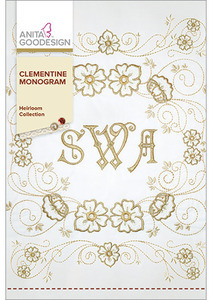 My favorite part of this collection is the flowers that were designed to go with the monograms. There are 20 different flowers and most of those come in two sizes as well. The flowers were designed to provide the perfect frame for your single or 3-letter monogram. The flowers were all hand digitized and the scrolls were created with a 7-ply stitch for a truly unique look.